Anchor Industries, Inc. is your source for the best in clear span tents. These structures are essential when presentation and size is critical. Whether for sale or rental, w showcase clear tents made from durable materials for weather protection. These units fare better than traditional pole tents for all types of outdoor gatherings and socials. Similarly, they are the ideal solution for large product launches, outdoor banquets, and management and hosting events. As always, these units offer ample space and room, and never serve as obstacles to focal points of your functions. •	Clear span tents resist all types of inclement weather conditions. This includes heavy wind gusts and rain, along with harmful UV rays from the sun. These tents also stand over extended periods of time for corporate parties, private events, sporting shows, trade expos and even team-building gatherings. •	Clear span tents are made from fire-resistant materials and lightweight alloys. This ensures maximum safety for event hosts, teams, and all attendees and guests. They also fully comply with all temporary enclosure rules. •	These tents can be assembled from the ground level. This eliminates the need for expensive equipment and/or installation teams. 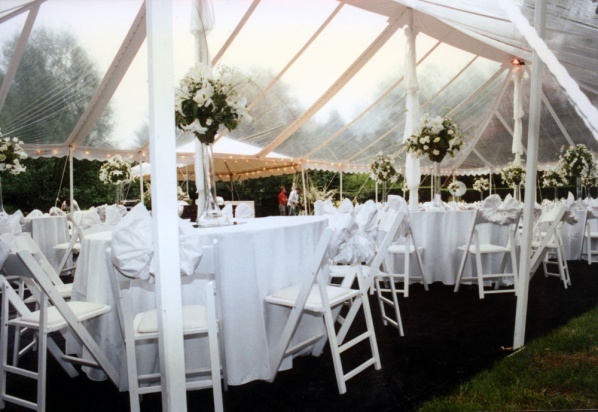 The PZ Party Series Clear Span Tents line is perfect for small parties and industry events. They work well for family socials, trade shows, and neighborhood parties as well. Available in 2.3M and 3M upright configurations, PZ structures offer true flexibility and functionality for any outdoor event or party. These clear span tents are also modular in nature, which means you can purchase components and accessories for optimal customization. The PZ Party Series fabric panels feature heavy vinyl, as well as wall configurations in clear vinyl, solid, or cathedral window styles. •	Engineered to ASCE 7-10 specifications. •	Anodized 4- channel aluminum. •	Clear span tents feature complete hardware and cable assemblies. You can also order single and/or double door units for the perfect accessories. We feature a choice selection of window patterns for clear span tents. Similarly, our team offers custom design capabilities, as well as full graphics services for tent customization and personalization needs.